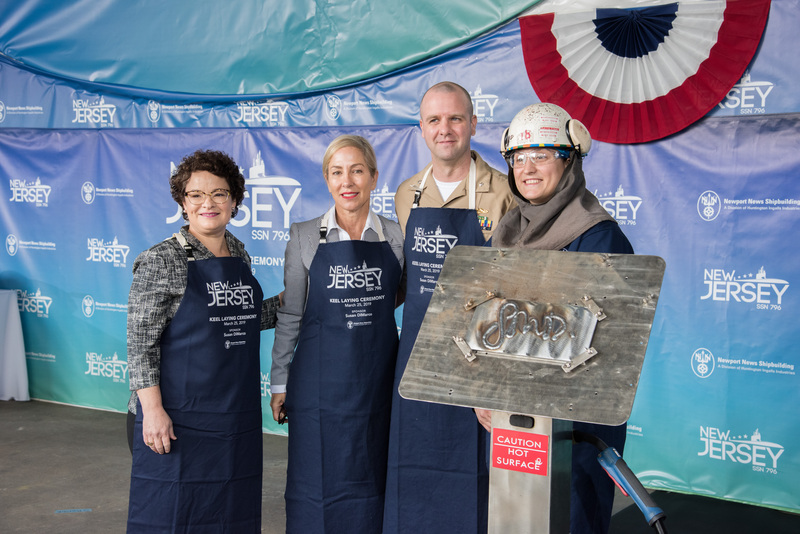 Huntington Ingalls Industries’ (HII) Newport News Shipbuilding division hosted a keel authentication ceremony on March 25, 2019, for the Virginia-class attack submarine USS New Jersey (SSN-796). «We enjoy participating in the Navy’s many traditions», said Jennifer Boykin, president of Newport News Shipbuilding. «They offer us an opportunity to pause and reflect on our daily work and remind the talented shipbuilders and the crew of the important role we all play in something much greater than ourselves – our nation’s defense». «This tradition also begins a journey and lifelong partnership between the sponsor and the ship», Boykin added. «It is said that a sponsor’s spirit becomes part of the ship». Susan DiMarco, a retired dentist, community volunteer and wife of former Secretary of Homeland Security Jeh Johnson, is the ship’s sponsor. She chalked her initials onto a metal plate. Shipbuilder Jess Batruk, who is originally from New Jersey, then traced the initials with a welding torch, signifying the keel of SSN-796 as being «truly and fairly laid». The metal plate will remain affixed to the ship throughout its life. «I am extremely proud to sponsor the submarine New Jersey, named for my home state», DiMarco said. «My family prides itself on service to our great country, and I am pleased to contribute in this way». Jeh Johnson and the couple’s son, Jeh Johnson Jr., who serves in the U.S. Coast Guard, attended the ceremony. Other guests included Representative Bobby Scott, D-Virginia, Representative Donald Norcross, D-New Jersey, and the sub’s commanding officer, Commander Joseph Spinks. USS New Jersey (SSN-796) is the 23rd Virginia-class fast attack submarine. Construction began in March 2016 and is about 42 percent complete. The boat is scheduled for delivery to the U.S. Navy in 2021.